The rooms were clean. The food was good. The personnel was polite. The food was good and there was plenty of choise. Big and clean appartment. Greate view to the mountins. Good food. Nice swiming pool. Good lobby bar. Good morning breakfast and dinner. 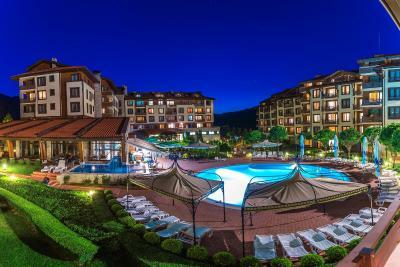 The only redeeming feature of the Murite was the spa and personnel who rented the space out from the hotel/condos; the pool, sauna, steam room, and whirlpool were also nice. Very good breakfast and dinner. Have good choice. 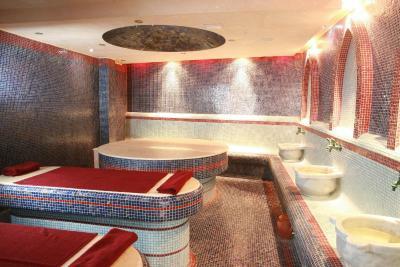 The jacuzzi was really good, the food was all right and the room met some of our expectations. The SPA was good. The water in the pool was warm. The food was fine. Murite Club Hotel This rating is a reflection of how the property compares to the industry standard when it comes to price, facilities and services available. It's based on a self-evaluation by the property. Use this rating to help choose your stay! 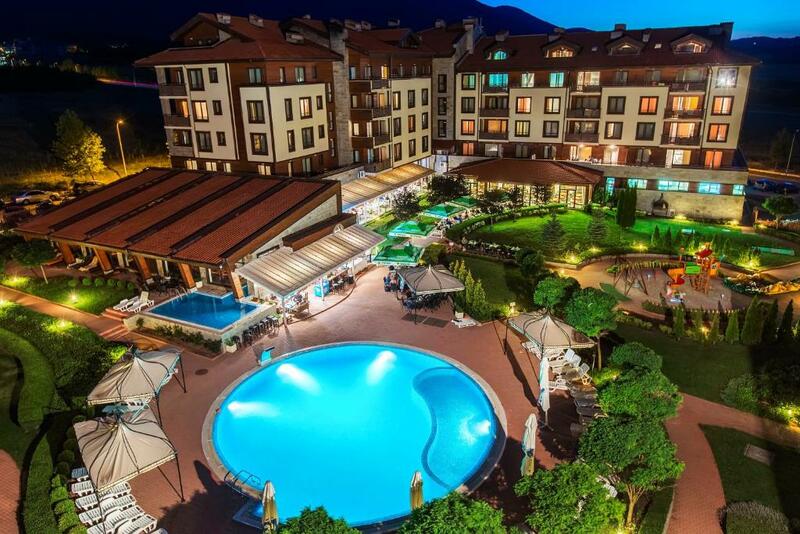 Located in the quiet Razlog Valley, the Murite Club Hotel provides superb accommodations and facilities surrounded by an impressive mountain panorama. Wi-Fi access is free of charge in all areas. 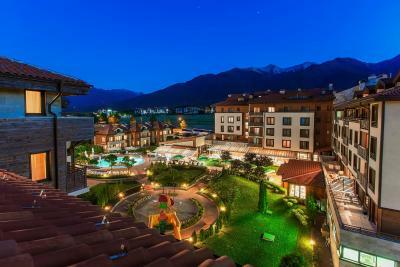 Parking is free of charge and a shuttle bus to Bansko is available also free of charge. The complex consists of 4 theme buildings - main building Azalia, Orchid, Kamelia and Jasmin. 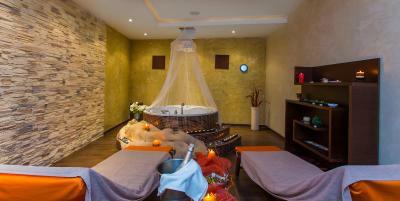 The main building provides luxurious spa and wellness facilities with a free of charge heated indoor pool, a sauna a steam bath, a hot tub and a fitness. At the property there are also a cozy lobby, a kid´s corner, a restaurant with a fireplace, shops, a night club and a games hall. 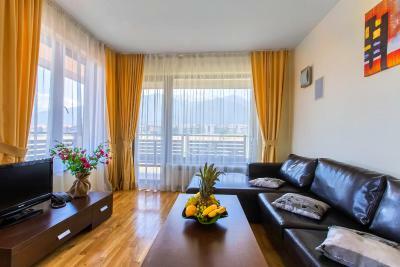 All apartments have a balcony with mountain views, and are furnished with oak floorings and carpets in the bedrooms. They all provide satellite TV, a sofa and iPod docking stations with a home entertainment system. Some also feature a large kitchen. 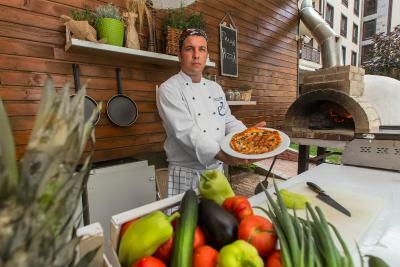 Guests of the Murite Club Hotel can enjoy breakfast at the on-site restaurant. In the evening, the cocktail bar serves a wide range of drinks and small snacks. Child care is also provided at the Murite Club Hotel. 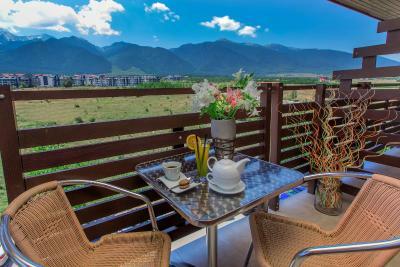 The property is located a 10-minute drive away from Bansko, 3.1 mi away from Razlog and 1,000 feet away from Pirin Golf. When would you like to stay at Murite Club Hotel? This apartment is located in Orchidea or Camelia House, next to House Azalia which is the main building. This apartment has a living room and a kitchenette. It is located in Orchidea or Camelia House, next to House Azalia which is the main building. The apartment also has a large seating area. This apartment has 3 bedrooms, 2 bathrooms, a living room and a kitchenette. 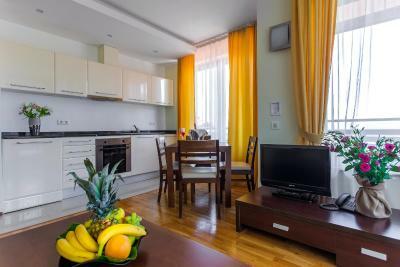 Located in the House Azalia, this apartment has a kitchenette and large seating area. 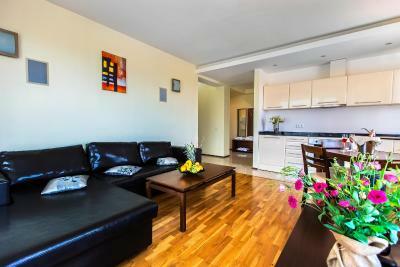 Located in the House Azalia, this apartment has a big living room and 2 separate bedrooms. 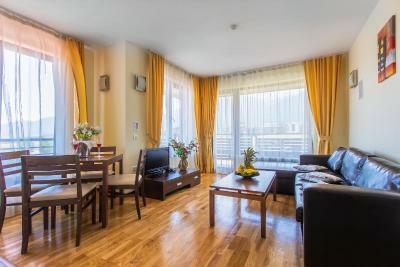 This spacious apartment is located in House Azalia, the main building. Each apartment has a modern iPod sound system. This room has a balcony, a bathroom with a shower or bath. It is located in Orchidea or Camelia House, next to House Azalia which is the main building. This room has a balcony, a bathroom with a shower or bath. It is located in House Azalia which is the main building. This apartment features a balcony, cable TV and seating area. This apartment has a balcony, satellite TV and washing machine. This apartment has a balcony, washing machine and kitchenette. This apartment features a satellite TV. 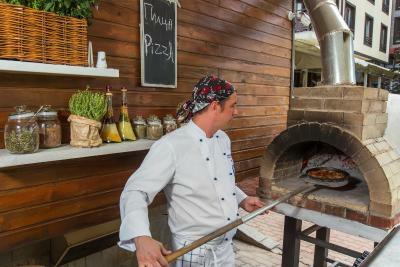 House Rules Murite Club Hotel takes special requests – add in the next step! Murite Club Hotel accepts these cards and reserves the right to temporarily hold an amount prior to arrival. Please note that a full set of kitchenware is available for rent and costs BGN 30.00 per stay. Please note that to access the swimming pool from the rooms located in the annex building, guests need to pass through the garden. The indoor pool was cold, the jacuzzi was cold and dirty. The breakfast was okay but didn't have deserts. The menu at the restaurant is limited. The location was perfect, mountain view, clean air, quiet place. The rooms were clean. The hotel is big and has a nice garden. The large indoor pool and the food were the best. Bad cleaning service, the whole stay 5d they only took out the trash, did not vacuum at least ones. Poor chose of food, and no variety. Bad personal service, they need more staff, no one can to offer us drinks during the dinner, it was more left on self service. Spa did not have good hygiene. The hotel is not too old to be in this condition, the furniture that is broken in the rooms should be serviced right-away. The buffet was overpriced for the quality. Cold dishes at an expensive rate. The staff was not very friendly. Rooms were basic but comfortable. The bartender was nice! The spa facility was bad. Some days the watter in the pool was cold. Some days the sauna was not working. The spa area needs better management. The first day the water in jacuzzi was cold and dirty. The second day water was clean and warm. And then the next day, again cold. The turkish bath was not working properly eventhough we asked to have it checked. Sauna was way too hot. The food was great! The personel: the maintenance guys - they were right there to help us when we had problem with our door lock and heating system.The cleaning ladies were very polite and good in their job. The check in desk personel always there, polite and willing to help or answer a question. The water in the pool was not that warm as I expected as we were with a young kid. We stayed in a 2-bedroom apartment where the usage of cutlery and dishes is paid and I do not believe that we should pay for few dishes and forks in a 4* hotel. We stayed in the main building - Asalia house. The hotel was very clean, well-heated and comfortable. The breakfast was very good. The staff was kind and friendly. ALL SERVICES IS ABSOLUTELY GOOD. The floor in our room was seriously damaged, our toddler could hurt herself. We had to cover that part with the table, which was inconvenient. Seems that the rooms need some renovation. The kids playroom could be cleaned more often. The food was nice, but not the caffe. The kids playroom is a great idea. The stuff was nice, especially in the restoraunt. The kids club and lady working there are great. Although the food was not amazing there were different dishes each evening. The entertainment program for the national holiday was well structured and orginized. I enjoyed the personnel, they were kind.